World Coffee Day – Meet With A Poem – 2018. Meet with a Poem – Less online, more offline friendship! Don’t rush give yourself a break on October, 1., sit together and share what you deeply feel and celebrate in a poetic way over a cup of coffee during the World Coffee Day. 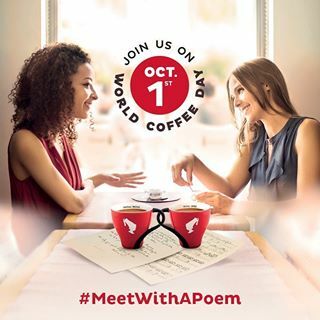 This year, celebrate friendship in a poetic way: join the Meet With A Poem event, select your Julius Meinl coffee location … Grab your pen and paper and off you go … write your poem. Here’s a couple of tips to go in Budapest and outside the Capital: Kis Virág Cukrázda (8. Klauzál Square), Marcipán (3. Béke Square),Nem adom fel (86. Baross Str. ), Irodalmi Kávéház (1. Egyetem Square),KIOSZK Budapest (4. Március 15 Square) last but not least T.G.I. Friday Restaurant (1. Váci Rd. – Westend City Center). At City of Szeged – Pianino (3. Londoni Blvd.) and City of Győr – Irodalmi Kávéház (1. Egyetem Square). Who is that special friend whom you haven’t seen in a while or ages? Give him or her a call and have a good chat, write your favorite poem on the spot and hand over to the waiter … celebrate together over a cup of coffee the World Coffee Day. Receive, enjoy your smooth and tasty coffee.